Close to beaches, town centre and Dorset Coast path. Sleeps 2. Eype View Apartment was completed mid 2008 to a very high standard and adjoins the owners' property. This 1st floor apartment comprises the following: Ground floor entrance lobby with stairs to open plan lounge, kitchen and dining area, one double bedroom and shower room all finished to an excellent standard. The kitchen is fully equipped with everything you need to express your culinary talents. The lounge boasts double patio doors & Juliet balcony with far reaching southerly views across roof tops & fields to Eype church. A TV and DVD player and a selection of DVDs, books and games are provided for your entertainment. We also offer wireless internet access to keep you in touch. Welcome pack includes a chilled bottle of wine, tea, coffee, milk. Access to the apartment is via private gated courtyard adjacent to off road parking for one car. Situated in a private road Eype View offers quiet and relaxing accommodation a few minutes walk from the bustling market town of Bridport. The small harbour of West bay is also within walking distance situated on the stunning Jurassic coast and was the location for the recent Broadchurch TV series. Full width shower cubicle with glass panel doors. Pedestal basin, WC and towel rail. Shaver point. Selection of DVD's, books and games. Local maps and tourist information. Welcome pack consisting of a chilled bottle of wine, tea, coffee and milk. Kitchen fully equipped with utensils, cooking equipment etc. Fridge with small freezer compartment. Free wireless internet access. Dedicated parking space for one car. Brilliant apartment, well equipped and clean and fresh. Slept well, comfortable sofa and wonderful view from the living room. Tiny point for improvement - the outside light by the front door is not very bright and doesn't light up the step onto the drive when it is dark. My wife tripped over the step and might not have done if the lighting had been better. However everything else was very good. I am so pleased you had a comfortable stay and thank you for your positive review. Thank you for pointing out the inadequate lighting outside the entrance area. I have now improved this by adding an extra light . This property was simply wonderful. The location was perfect, a short walk to the centre of town but very quiet apart from the birdsong which was a joy to wake up to - even heard an owl! The views across the fields were stunning and made you want to get out there and enjoy the scenery. The apartment was warm, well maintained, fully equipped, very clean and had a very comfortable bed. We stayed for 2 nights but wished we could have stayed for longer. There are lots of stunning walks around the area. We caught the X51 bus to Charmouth then walked back along the beach to Seatown where we headed inland across the fields to Bridport. On Sunday (no bus service) we got a taxi to Abbotsbury (£30) and walked to West Bay then back along the river to the apartment - it was all lovely. Bridport has a good selection of places to eat and drink but the best beer by far can be found at the 'Pursuit of Hoppiness'. Helen was a wonderful host and very accommodating. Check-in was easy even though we didn't arrive until after 8pm. We'll be recommending this apartment to friends and family and will certainly be back again ourselves! Lovely clean property and it has everything you may need. All as described , well equipped and comfortable accommodation,if cosy, but just what we needed as out everyday. The weather was wonderful. The apartment was clean , well equipped with all we needed to cook and Helen friendly with good tips on where to go. Lovely walking from the house and we used the Jurassic coast bus, so minimal car use. Bridport is an interesting quirky place with lots of character, small shops, artists, antiques and good restaurants and cafes. Only five minutes into town and it’s downhill one way ! 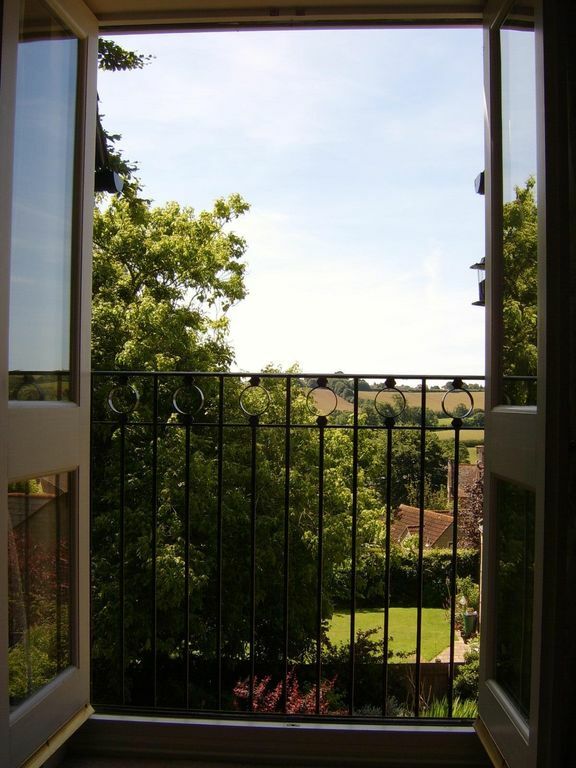 Helen’s apartment is well located within a Bridport for easy walking access to supermarkets, shops and pubs. The apartment is in a very nice part of the town and is well presented and very comfortable. Highly recommended. Well thought out and attention to detail. Lovely location too! Eype View Apartment is set in a peaceful, elevated location on the western fringes of the bustling market town of Bridport, famous for its net and rope making. Ideally located for a wide range of activities including cycling, birdwatching and fishing. It is an excellent base for walkers, being situated on the beautiful Jurassic Coast; Britain's first Natural World Heritage site which includes Golden Cap and the breathtaking Chesil Beach. The local beaches at West Bay and Eype are within walking distance. West Bay and Eype locations for the Broadchurch crime drama. Bridport and the surrounding area boasts a wide selection of pubs and restaurants catering for every taste, seafood being a speciality in many establishments. The apartment is within easy reach of the Cathedral City of Exeter, the county town of Dorchester, Poole with it's famous harbour and the traditional seaside resorts of Weymouth and Lyme Regis. Chesil beach and the pretty village of Abbotsbury are close by . All the above accessible by regular local bus services. Outside of high season we welcome enquiries for weekly, weekend and mid week breaks throughout the year. Please do not hesitate to contact me concerning stay lengths not included in above.